Of his 70 years on this earth, Davino De Poli has spent almost 55 of them working and is not a man to believe in coincidences or fate as his DNA has given him a tangible desire to face difficulties head on and resolve them. However an aspect of his character means he never acts alone but relies on the support of his family. A family that has roots deep in two centuries of history, so much so that recently it received DOC branding by the Querini Stampalia Foundation in Venice. 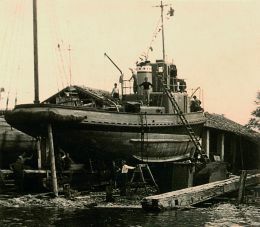 My meeting with Davino, who is also spokesman for the family, took place at his boatyard in Pellestrina. The De Poli family was already recorded as master carpenters in the Napoleonic registers. What does it feel like to have such ancient origins and to now have become the leading Venetian boatyard industry? Without doubt satisfied, proud, I'd say, but a few things need explaining. Our family continuity is characterised by union and togetherness, but also clever delegation within this context, giving others room for action to best represent the company. This basically means being able to create programmes and follow them through. I have been entrusted with the task of running the company and therefore of having to decide. At times I am reckoned to be unscrupulous, but I think this is a restricted view of the problems, an inability to follow the thread running through my plans. However, I admit that a certain lack of limits is one of my personal characteristics and I do realise that at times this leads me to taking excessive stands in all fields. Commonsense and experience mitigate all this, I think. What background do you have as a businessman? As a boy I was destined to become a naval captain, but the financial downfall of my father and his brother, master carpenters, radically changed my life. At the age of 15 I went abroad and there I remained until I was 18: from a life where I was protected, coddled and paid for, I found myself living another reality - brutal, hard, humiliating. However, while someone else might have sunk, I swam and on my return to Pellestrina, enriched by all that experience and by a discreet knowledge of another 3 languages (English, French and Spanish), my ideas were clear: I wanted to succeed and become someone, even if I didn't know where. I wanted to get my own back for all the hardships I had suffered. I set myself some intermediate objectives, taking a breather at each stage to then set off again. I have never set limits to the company's development and time has proved me right. What were the stages of this growth process? Once I had a good idea of the boatyard's problems and seeing that the world of master carpenters and wooden boats was over, my brothers and I studied a strategy for recovery, took up the reins and overcame the consequences of the family's downfall. I have to say that with the emotional intelligence that has always characterised my family, our parents have let us know to be very grateful. How did the recovery come about? In four stages. 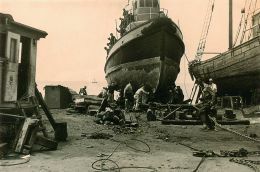 At first we started to do repair work and to produce small boats in iron. It was a long period of consolidation work full of sacrifices and lacking in satisfaction, which lasted about twenty years (from 1955 until 1976). In the end however we reached the objective that I had set myself with the acquisition of an order and the production of a ferry to link the Lido to Pellestrina (for passengers and cars) for the ACTV, the Venice council transport company. This first success in the scenario of the Venetian lagoon gave us economic security, peace of mind and time also to dedicate to our families. We could have continued like that for a long time, but for me routine is the road to death and I wanted to look for new satisfactions and new professional stimuli. At that time we employed 30/40 people in the boatyard and I was of the opinion that we needed to look for new clients for more important projects. So I started to spend time on the commercial side of things, which up to that moment had been neglected. I believe in synergy: one man can work well on his own while he is operating in his own dimension, beyond that you need a team and so I created one with my brothers. And this was when you realised you could accelerate. We had to. During this second period, production became more sophisticated, programmes more specific and we got round to creating a staff (administrative, technical, etc.) that let us achieve certain benefits but also led to an increase in costs and the need to increase turnover, making use of outsourcing. 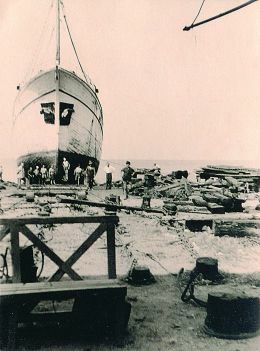 The number of people employed in the boatyard gradually increased, stabilising at 100 on the payroll, but today we have 700 external collaborators. Progress that has also marked the company's technical enrichment, and the presence of an increasingly more demanding clientele, including the Italian Navy. We also produced a series of 5 tugs in this period up to 1985. When did the real evolution happen? Between 1985 and 1995, during the years when we consolidated development with decisive choices, by then assisted by my daughter, my son and my grandchildren. 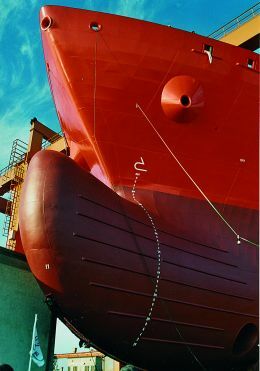 The production of new generation tankers for chemical products started in this period (nothing to do with the sadly famous sea tramps), because these represent a fundamental guarantee for preventing sea pollution and offer absolutely safe transport of potentially very toxic products. Is this one, that I call the attainment of "autarchy". We personally do the market surveys, order the boats to be built from the boatyard and then place them. To expand the company's solidity we have also started to invest in property, such as the tourist village in Rosolina, the Dogi hotel in Venice. This stage is a really complex one and hides an extreme difficulty in my role, with maximum personal risk. How do you manage to work in Pellestrina, in such difficult logistic conditions? Staying in Pellestrina was another bet, because rationally the boatyard should be on the mainland. Here we had to contend with sentimental problems of nostalgia for our origins that wouldn't let us leave our island. There are two sides to every coin: if the high costs that penalise my decision to stay on the island are the reverse side, I have to say that the good relations we have with the world of work make up for it. I like to define Pellestrina as the "outpost of the lost men", and in this sense, those who live on this island, 70% of our workforce, learn to resolve many things on their own, through human relationships and commonsense. We are tough men, born to fight against the forces of nature, our real enemy. We therefore take life's hard shots with a certain detachment, while continually attempting to resolve them. What is your relationship with the workers? As I said earlier, here there is non-of that trade union toughness that characterises other areas, the relationship is a good personal one, but on the other hand, the spirit of the employers' is by no means "feudal". In terms of turnover, what has been the company's progress? In effect our turnover is a good indication of the gradualness and level of our development: we have gone from 20 billion in '85 to 60 billion in '95, to 120 billion today (in the old lira). Taking into account Venice, San Pietro in Volta, Pellestrina and Chioggia, there used to be around forty master carpenters' boatyards. Slowly but surely they have closed down and some of them have gone bankrupt. How has the De Poli yard managed to remain the bulwark of the boatyards in Venice? By managing to transform. Adjusting to market times and demand, a courageous choice that has meant it has not been involved in the European deterioration of this sector. Now the real limits to expansion of our boatyard are the physical characteristics of the island of Pellestrina, its limited width (200 metres at its widest point and 7 km in length) and the limited width of the through canals. Besides De Poli, today there is the Pietro Menetto yard, Sanpierote and Attilio Menetto's, which builds fishing boats: these are the working boats that the lagoon calls for. The Sanpierotta was organised like this by the Schiavon in San Pietro in Volta which has now disappeared. What are your conclusions when you look from the past to the future of your yard? If you can look at the past, live for the present and project into the future, as I have done, life is a marvellous experience. I can in fact evaluate the errors I have made and plan the future with the decision not to repeat them. Today however the new generations are different and I don't know if this is better or worse. A new element exists that we must take into consideration though - the speed at which all changes happen, so that I personally wouldn't be able to forecast what will happen in 10 years time. I can only say that I have been lucky in life and in my work. Certainly I may have lost a few battles, but I think I have won my wars. Now we need better thinking heads than in the past. I already see that my daughter may have the edge over me in the new world of technological innovations. What do you think of a woman as manager of a company? Chiara is the general manager of the yard and commissions manager. I must admit that I have changed my mind about women: I think that they can outclass men in sagacity, and perseverance. She is also more willing to face sacrifices. Whereas once I considered my wife solely as the mother of my children and for this reason she has perhaps sacrificed an activity that could have given her satisfaction She has been the companion to my pretentious will. She has followed me and has completely fulfilled her role as lady of the house. Even if she has never got involved with the real business side of things, she has always been at my side psychologically, there to help me for better or for worse. I must say that my brothers and I have wives and sister-in-laws of a very high profile who have never created divisions between us and if there has been rebellion in the air, in the past, this has been overcome by commonsense. Just think that during the first 10/12 years of business these women were put on the payroll with salaries lower than that of the employees. Today, maybe they are getting their own back, but they deserve it. What could revive Venice in your opinion? I think that Venice's maritime vocation leads it to focus on high- value passenger transport. A classy market is hers: cruisers and super-yachts with which good use could be made of the dockyards in addition to the maritime station. The industrial port must aim as much as possible at procedures for not dividing loads and select deposit stocks as much as possible because handling is a progressive cost. Since the year 2000 Venice has gone from a presence of twenty to two hundred super-yachts each year. Does this expanding market interest you? Definitely. I am already studying the question. The super-yacht market is in continual, incredible expansion. From surveys carried out it emerges that only about 10% of demand in this market is met - figures that speak for themselves.